Ingolstadt (German pronunciation: ; Austro-Bavarian [ˈɪŋl̩ʃtɔːd]) is a city in the Free State of Bavaria, in the Federal Republic of Germany. 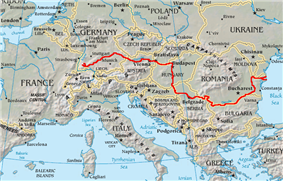 It is located along the banks of the River Danube, in the centre of Bavaria. 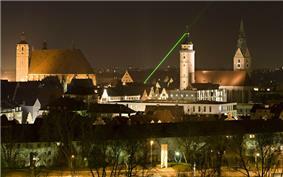 As of 31 March 2011, Ingolstadt had 125,407 citizens. It is part of the Munich Metropolitan Area, which has a total population of more than 5 million. The Illuminati, a Bavarian secret society, was founded in Ingolstadt in the late 18th century. It is the site of the headquarters of the German automobile manufacturer Audi, defence aircraft manufacturer Cassidian Air Systems (formerly EADS DS), and electronic stores Media Markt and Saturn. Ingolstadt is the birthplace of Luftwaffe Ace Josef Priller, and was for a long time the home of the notorious Dutch war criminal, Klaas Carel Faber, who was responsible for more than 22 murders during the Second World War. Before his death in 2012, he had been on the Simon Wiesenthal Centre's world-wide most wanted list. Ingolstadt was the capital of the duchy Bavaria-Ingolstadt between 1392 and 1447. 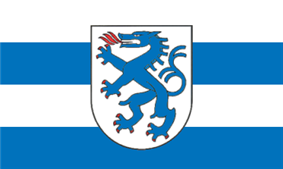 Ingolstadt was then united with Bavaria-Landshut. Louis VII, Duke of Bavaria ordered the building of the New Castle, whose form was strongly influenced by French Gothic architecture. In 1472 Louis IX, Duke of Bavaria founded the University of Ingolstadt which became the Ludwig-Maximilians-University. In 1800 it was moved to Landshut and eventually to Munich. The University of Ingolstadt was an important defender of the Roman Catholic Church during the Reformation era, led by such notable scholars as Johann Eck. The remains of Gustavus Adolphus' horse can be seen in the City Museum. The horse was shot from under the king by one of the cannons inside the fortress, a cannon known as "The Fig". When the Swedes withdrew, the city preserved the remains of the king's horse, eventually putting the form on display. It has remained thus for almost 400 years. After the French invasion in 1799 the fortress was demolished and the university was relocated to Landshut. In 1748, Adam Weishaupt, the founder of the Order of Illuminati, was born in Ingolstadt. Adolf Scherzer composed the "Bayerischen Defiliermarsch". Mary Shelley's Frankenstein was set at the Ingolstädter Alte Anatomie (Old Anatomy Building), now a museum for medical history. The famous writer Marieluise Fleißer wrote Pioniere in Ingolstadt in 1928. 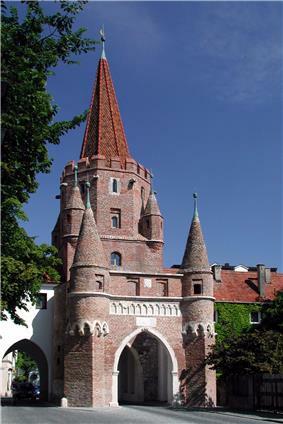 As one of five ducal residences of medieval Bavaria — besides Landshut, Munich, Straubing and Burghausen — the city of Ingolstadt features many Gothic buildings, such as the Herzogskasten (Old ducal castle; ca. 1255) and the New Castle, which was built from 1418 onwards. The largest church is the Gothic hall, Church of Our Lady, which was begun in 1425. Also the churches of Saint Maurice (1235) and of the Gnadenthal and Franciscans monasteries date from the Gothic era. The Kreuztor (1385) is one of the remaining gates of the old city wall. The Gothic Old City Hall was constructed in the 14th century, and later altered several times. Ingolstadt is home of one of Germany's foremost business schools: the Ingolstadt School of Management. It is the department of business administration and economics of the Catholic University of Eichstaett-Ingolstadt. In national rankings, the business school regularly scores among the top ten, which is due to its high academic quality and excellent student:professor ratio. The faculty maintains a large network of partner universities for international educational exchange. The Ingolstadt School of management offers bachelor's and master's degrees in business administration (German: BWL - Betriebswirtschaftslehre). Among the academic programs offered are also an executive MBA and doctoral degrees. The University of Applied Sciences Ingolstadt is a new university for technology, computer sciences and business administration. With around 2,500 students the University is the biggest institution of learning in Ingolstadt. Several scholarship programmes supported by companies such as Siemens and Temic provide gifted students with financial assistance during their studies. These students deepen their practical experience by working at these organizations. The University of Applied Sciences Ingolstadt offers several undergraduate and graduate programmes. Every programme is listed under the top 25 in Germany. Ingolstadt is especially known for ice hockey and association football. ERC Ingolstadt, founded in 1964, plays in the German Ice Hockey League since the 2002-03 season. With the exception of its season of debut and 2007–08, the club has reached the national play-offs every year as of 2014, and has reached the semi-finals three times. They won the German Ice Hockey League Championship in 2014. The football club FC Ingolstadt 04 came into existence in 2004 after the merger of the football branches of MTV Ingolstadt and ESV Ingolstadt. In the 2007-08 season, it was promoted from the third highest division at the time, Regionalliga Süd to 2. Bundesliga. In the 2008-09 season, it was relegated at the penultimate place, but was promoted again in 2010-11 and remained in 2. Bundesliga till 2015. In 2015, Ingolstadt won the 2. Bundesliga and were promoted to the country's highest league, the Bundesliga. Ingolstadt is one of the many settings in Mary Shelley's novel Frankenstein. Primarily, Victor Frankenstein attends university in Ingolstadt. The musical version of the novel, Frankenstein - A New Musical has many scenes set in Ingolstadt. Dr. Faust is mentioned in an old and short local tale. The X-Files episode "The Post-Modern Prometheus" makes a reference to the University of Ingolstadt. This was an allusion to Frankenstein, as the episode was filled with Frankenstein references, and the full title of Frankenstein is actually "Frankenstein: or, The Modern Prometheus" (also see: Prometheus).